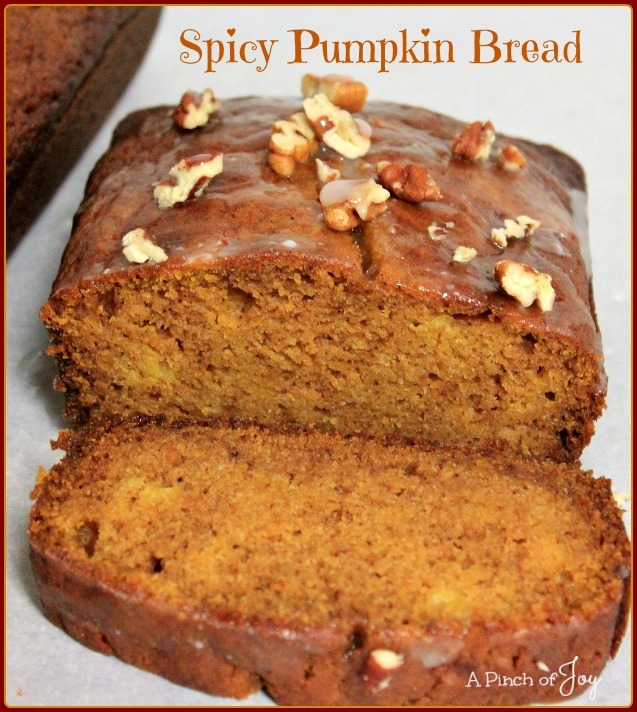 A light bread with lively flavor, Spicy Pumpkin Bread is great anytime. Serve plain or with whipped butter to let the spices shine. Or dress it up with a glaze for a more festive appearance and let the sweetness of the glaze complement the spices. To glaze a single loaf, start with a quarter cup of powdered sugar and add water a teaspoon at a time, mixing well after each addition, until you reach the desired consistency. I use 2 teaspoons of water per quarter cup, but you might like yours a little thicker. Add a few chopped nuts on top of the glaze, if you wanna be fancy. Adding nuts or raisins is optional. My favorite add in is English walnuts. That causes Bytes to mutter darkly. We can compromise on pecans without muttering so that’s the occasional choice. Other add ins might include dried cranberries or other fruit. I’m not crazy about chocolate with pumpkin, especially a spiced pumpkin flavor. But if that’s what floats your boat – go right ahead and add a cup (or more) of chocolate chips! Being the chief cook gives you lots of power!! A light bread with a deep and gently spicy flavor. Beat together eggs, sugar, oil and pumpkin until light and fluffy. Add dry ingredients and mix thoroughly. Bake at 350 for 45-60 minutes, until toothpick inserted into middle comes out clean. Remove from oven and let bread set in pan for 10 minutes on rack before removing to cool.